I'm going to create web 2.0 Blog/Profile backlinks, only on sites that have a lot of authority in Google's eyes? The PR on the main domain is from 8 to 10. The DA (Domain authority) is 80+/100, so it's huge! (Contextual Backlinks with Related Images). These sites are not just some sites that you can spam with GEO tools, you have to do it manually. These are web 2.0 sites like Adobe, Tumblr, Vimeo, Drupal, Wikidot, Jimdo, Wordpress just huge authorities! It's very important what website is linking to you, even if the link comes from inner pages., but it's also important the page itself. I will also submit content to your profiles (that you will give me, or i will help you), more unique related content = more value for Google. Please keep in mind to avoid any type of footprints, we vary the sites we use. Create a new email account. Create accounts manually on each site. Verify each account using email. login on each site and submit the data you gave me. I save links, create the report and send it to you. Additional Feature: For permanent link indexing, the backlinks are sent to my personal private Paid Indexer which also provides Great Indexing to all your submissions using own strategy. Available for the websites, YouTube videos, Social Pages representing You or Your Company or anything you can link to. Feel free to reach out if you are looking for additional information or different SEO services. ✓ Service based on the latest Google updates 2018! I work with White Hat manual methods, 100% Google Panda 3.0, Penguin 4.1& Hummingbird Safe, based on the latest Google updates. With natural High DA Web2.0 Backlinks and SEO Technic, your site starts ranking for sure which is loved by Google algorithm! At the end of our work, you will receive a handy and nice report with all created backlinks. 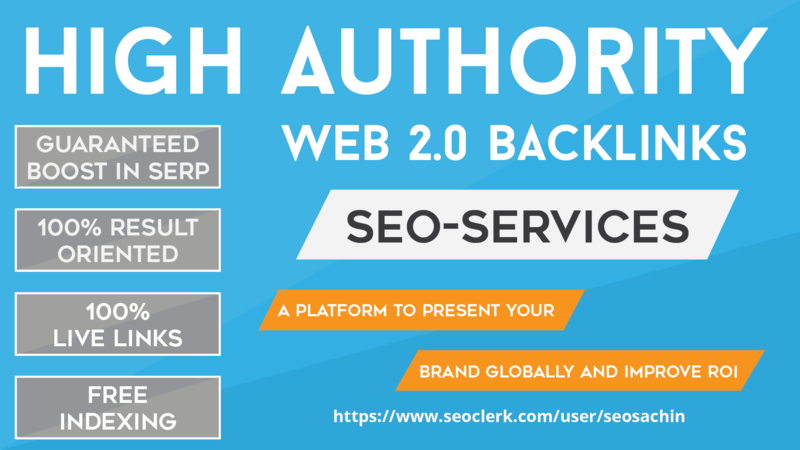 Exclusive Offer - add 100+ Web 2.0 High Authority Profile Backlinks On DA80-100 Sites is ranked 5 out of 5. Based on 11 user reviews.